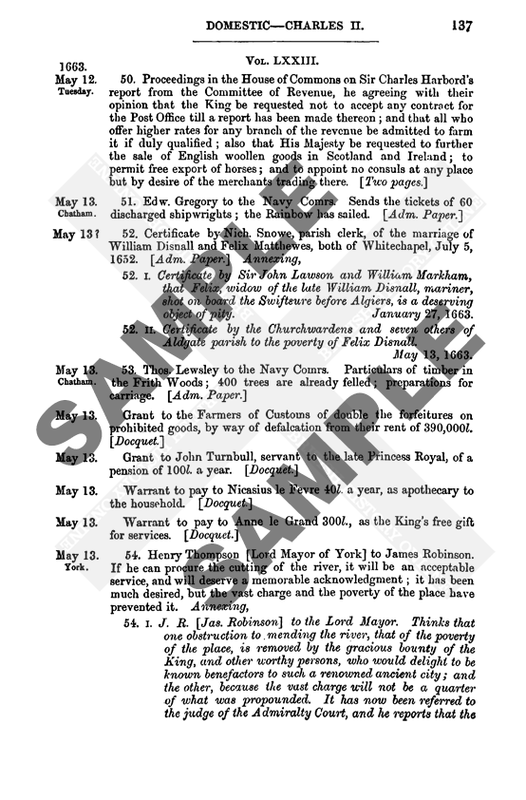 Calendar of State Papers Foreign: Elizabeth, Volume 1, 1558-1559. Originally published by Her Majesty's Stationery Office, London, 1863. B. M. Sadler, 1. 464. Cal. B. x. 39. 1377. Sadler and Crofts to Cecil. They have had no news from Balnaves since his departure fourteen days ago, nor yet from Randall (alias Barnaby), whom they sent ten days since to go to the Earl of Arran. The French fortify Leith, where three sails have arrived, wherein is the Bishop of Amiens and 300 soldiers; but they have no certainty of La Brosse. That morning a great ship passed by here, wherein it is supposed he is. They hear that the Protestants meet often, and that the Duke of Chatelherault has been in consultation with them, and that they have commissioned the Earl of Glencarn and the Lord of Donn to suppress the abbey of Paisley, whereof the Bishop of St. Andrew's, the Duke's brother, is commendator. The Duke also sent word to the Regent requiring her to stay the French fortifications at Leith, or that the nobility of Scotland would not endure it. She answered that it was as lawful for her daughter to fortify in her own realm as for him to build at Hamilton, and that she would not stay it unless she were by force impeached. It is taken ill on both sides, and now it is said the Duke will take plain part with the Protestants, and that they will soon rise and come forward with power; but they lose much time. When Balnaves was here he said he thought this could not be before the beginning of October. The writers look daily for news from him, and also from Randall, to whom they gave a cipher. At the writing hereof they have heard that the Protestants have broken up their Diet and are gone to levy their power, to come forward with what speed they can. They hear also that the Regent sent for the Earl of Huntly, who refused to come, and that his son, Lord Gordon, is with the Protestants. The writers have met the Scotch Commissioners several times touching the Border matters, with whom they parted friendly, the Scotch having business on hand, and hastening this treaty.—Berwick, 27 Sept. 1559. Signed. Orig. Add. Endd. by Cecil. Portions in cipher, deciphered. Pp. 4. 1378. Draft of the above. Portions in cipher, deciphered. The Regent of Scotland has made proclamation to be made in the Merse and Lothians that no Scottish bring any victuals into this town, nor have any traffic with Englishmen, upon pain of death, in order that the victuals might be kept in Scotland for the better victualling the French garrisons; and that no intelligence might be brought there of their tumults and troubles. Nevertheless the Scots, on the market day, repair to Berwick after their accustomed manner. The Regent has Sadler in great suspicion, but the matter has been so handled that they shall be able to prove little. He wishes, when his services here can be spared, to be recalled, as this is an ill place for him to winter in. He thanks Cecil and the Lord Admiral for their intention to visit his house, and begs to know whether they have done so.—Berwick, 27 Sept. 1559. Signed. Orig. Hol. Add. Endd. by Cecil. Pp. 2. B. M. Calig. B. x. 39. 1380. A short note of the above. Minute of a letter to the Lords of the Congregation, meant to be sent, but afterward stayed. Are heartily sorry to hear that the goodly enterprise of the Lords for the advancement of God's glory and for the safe defence of their country from the French is thus unfortunately stayed. They give them advice to knit themselves firmly together, and to have good regard not to be entrapped into the enemy's hands, and to use all means to allure the whole nobility of the realm to take part with them. The French doubtless mean to subvert and "extinct" the native blood of Scotland, and if the native Scotch Queen die without issue, to annex that realm perpetually to France. They may assure themselves of help out of England if they sustain their own cause bravely and honourably; who, rather than see them the prey to France, will show herself an open enemy to their adverse party. This is said not without good commission, and they beg them to send a man to show their Lordships' pleasure with speed. MS. Burton-Constable. Sadler, 1. 463. Since the letters by John Bynks, he [Cecil] has not heard from Sadler, and daily looks for intelligence. Hears that the French have sent a Great Seal into Scotland, graven with the arms of France, England, and Scotland, and naming the French King and Queen, King and Queen of France, England, and Scotland. Whereof begs him to inquire, as these proceedings are too sharp to be borne. Cannot tell from whom these letters come, but begs him to read, seal, and send them. Is told that the Marquis d'Albœuf is gone into Scotland.—Hampton Court, 27 Sept. 1559. Signed. 1383. Alexander Whitlaw to Cecil. Has been directed by the Duke, the Earls of Arran and Argyle, and the Prior of St. Andrew's, to communicate to Sadler and the Captain of Berwick the order of all things since the home coming of the Earl of Arran, to whom he declared the same by mouth at length. All these things Cecil will more fully understand by a letter from the Earl of Arran, which Whitlaw has delivered to be sent with diligence. The Earl of Arran's home coming is no small comfort to his country, and is well received of all men. The Queen Regent can get no knowledge thereof. The hearts of the people thirsted for this unnatural war to be cut away, which heretofore has been enemy to the same, but now is united by the truth of God's Word in heart. At present their defection from France is great, by reason of the fortifying of Leith and other enormities, such as slaughter and other oppressions, which daily ensued. Refers him for other things to their writings. Has received no answer to his last letter.—Berwick, 27 Sept. Signed. P. S.—Begs Cecil to communicate some part of his mind to his poor friends. The counsel of poor men furthers this matter not a little; worldly men seek the profit of themselves, and not the weil of this common action. Yesternight Mr. Marshe, the Governor here of our nation, from Antwerp repaired to him with the copy of a letter of the 25th inst. to Cecil by him addressed, concerning the intelligence furnished by one Jehan d'Ancy, whom he brought with him to the writer, and who repeated before him the contents of the said letter of the 25th May. The names being French, he will in part repeat them. As first of Petre Coke, alias Pierre le Cuisinier, dwelling at the Black Friars, near the house of Francisco Pichier, the Queen's currour; which Petre Coke, with Jehan Tirarde, Gwillaume de Puis, alias Puie, a goldsmith dwelling near St. Anthony's Church, Thibault le Pignart, alias Combemaker, dwelling over against Pepper Alley, in Southwark, and two, called the one M. de Bigny, the other Jehan le Beu, dwelling both in a house of their own within St. Thomas's Hospital, and one Galerte, lying within Petre Coke's house, are by this deponent's report notable spies for the French, having promised at all times the conveyance away of the French hostages, as Petre Coke with others were afore the instruments for the conveyance of M. d'Estanges and de Carze's forth of the Knight Marshal's guard. Though the discoverer may be deemed of no credit as contriving the tale in hope of a reward, (as does the writer himself upon examination as to how long since he came forth from Calais) yet men in these cases cannot be too vigilant and fear too much, having respect with whom we deal, whose enterprises stand most upon surprises; witness of Calais, of which attempt a like notice aforehand was given by a like discoverer then despised, with over late repentance. Si mens non lœva fuisset! Has therefore entertained this Jehan d'Ancy, giving him twenty dallers (fn. 1) in hand, with promise that if his report were true he should not want a living in England. It may soon be tried of what moment this matter is, since he so plainly discovers so many names and dwellings of the parties. Marry, lest any escape it would be good, if it might be, to be sure of all their forthcoming at once, lest some start away. Petre Coke and G. le Puis, as the chieftains, are to be first had in question. Wonders he has heard nothing forth of England since the 1st inst. Spial money would do the Queen better stead here than he himself is able to comprise; all is not clear aboard here. M. d'Egmont is again returned out of France, who, with diverse other great men and gentlemen possessing arms, lies much at Antwerp. The Rhinegrave, being not yet departed (for all his sayings to the writer), resorts to and confers with them. This Jehan d'Ancy affirms that the Rhinegrave is appointed to be the colonel of certain ensigns of Almains now in part already prepared, and tarrying for him at Hable Neufe, and partly looked for out of Almain. He said also that the French have in their heads the surprise of a place about Dartmouth, to make there a fort of site impregnable. "Omnia timete, and provide for the next year as if you had already the cartel of defiance." He told them also what great quantity of victuals were by stealth forth of sundry parts of England, (namely from Ipswich,) conveyed to Calais; barrels of salt beef, &c. As for Dunkirk, (the writer speaks of his own knowledge,) assures him it passes all measure, more than a Calais while it was ours. Such stealth defrauds the Queen and the realm. The searchers in England are dumb dogs, being corrupted with Offam Cerbero. Two or three searchers to be entertained at Dunkirk, and such like in Zealand and other principal places, would save the Queen at least 5,000l. a year. Mr. Governor deserves thanks for the discovery of such stealths; if he had charge and allowance of the Queen for that purpose, it would turn to a great good use.— Brussels, 27 Sept. 1559. Signed. P. S.—Much talk here of the preparation in France for the wars, noted against us. Calais was lost at Christmas. Hears that in Spain the Inquisitors have taken up the bones of the Duke of Nazareth, buried seven years past, and cited him as present for heresy. If he be convinced, woe be to those bones! Much ado in Spain for the Inquisition, not without tumult and grudge as he hears, but will learn further, for this is no place to understand otherwise than omnia lœta. Orig. Hol., with two armorial seals. A few words in cipher, deciphered. Endd. Pp. 6. 1385. Another copy of the above. A few words in cipher, deciphered. Corrected by Challoner, and endd. by him: Sent from Brussels by Mr. Governor. Pp. 6. B. M. Galba, C. 1. 41. 1386. Abstract of the above. 1387. John, Duke of Finland, to the Queen. Thanks her for her letters delivered to him on 27 Sept. by her servant, Henry Knol, in which she expresses her satisfaction at hearing of his safe arrival in England. He has further understood, by the said Henry Knol, that she has directed the Earl of Oxford to provide for the conveyance of the Duke and his baggage to London. For this kindness he thanks Her Majesty.—"Harwick," 4 Kal. Oct. 1559. Signed. Orig. Add. Endd. Lat. Pp. 2. MS. Burton-Constable Sadler, 1. 467. 1388. Sadler to the Duke of Chastle Herault. Has received his letters of the 21st, containing more thanks than he [Sadler] deserved. Has heard of the bearer of his well doing, and prays God that the Duke's proceedings for God's glory and for the defence of his country from foreign government may prosper; and that he may not pretermit such good opportunity as he now has for the same.—28 Sept. 1559. MS. Burton-Constable Sadler, 1. 466. 1389. Sadler to the Earl of Arran. Having received his letters of the 21st, and heard news from the bearer, now sends the Earl's letters to Mr. Secretary. Marvels much Randall has not arrived with the Earl, as he left twelve days ago. Will do the Earl any service he may in all his noble and godly enterprises.—28 Sept. 1559. This bearer is a Provençal, lately come out of Naples, through France, having matter of importance to declare to the Queen; who repaired to him for letters of recommendation and address to some of the Council. "Partly by his talk it should appear there is a practice in hand for the revolt of Provence by the Protestants there, and the surprise of Marseilles; wherein the Turk should give assistance by means of a French forenscite now in Naples, called Michel de Covenac, a Provençal, long Ambassador in Turkey. The letters written unto you by me and Mr. Governor, (fn. 3) maketh me doubt guile in all this kind of men. He would gladly have known of me how it standeth between us and Scotland, touching the Earl of Arran. The answer I made was 'Quod nescio,' referring him over unto you. He talketh of great revolts like shortly to be in some parts of France. "—Brussels, 28 Sept. 1559. Orig. Hol. Partly in cipher, deciphered. Add., with armorial seal. Endd. by Cecil: 28 Sept. 1559. Pp. 2. 1391. Draft of the previous letter. The portion which in the copy despatched is written in cipher is here in Challoner's holograph. Appended is the following "Memorandum," which does not occur in the fair copy: He speaks of Dragut Raiz: of the displeasure the Turk beareth to the French for making the late peace.—27 (sic) Sept. 1559. Endd. : 27 Sept. 1559. Sent by a French gentleman, al[ias] a Sp[anish], Antonio Vellaz. Pp. 3. 1392. Challoner to the Queen. Having informed her in his letter of the 18th inst. what measures he had taken to advance the motion for the passports, adding what good hope of success he conceived, after a pause taken for M. d'Arras to speak with the Regent and Council, at last he was informed by M. d'Arras that though the number of horses to be exported was so small as to appear almost a private motion by Grenado, yet the Regent and Council had resolved to suffer no horses to pass forth of the country, nor powder or munitions of war, until the Prince himself for his garrisons were sufficiently served, standing at this instant at such disprovision. Wherefore the passports for the horses and powder could not at present be granted. With respect to the Colen Clevis the secretary Vanderaw had received instructions to have a passport made out for the number Challoner required. This answer M. d'Arras said he had from the Regent and Council. Hereupon Challoner determined to consult Mr. Gresham, the Queen's factor, and afterwards himself to speak with M. d'Arras. So going yesterday to the Bishop he informed him that as to the powder, provision thereof may be had not only abundantly but also in time convenient, the wars being now so well ceased. "And the sembable (quoth I) may I say for the horses, for four of them are more than a month since bought by Grenado with Her Majesty's money; no paragons, Sir, so that you mistake them not, for, one of them only being a mean jennet, the rest are Clevois horses, bought by his servant at Colen (that I added for a purpose), other four of a better sort he would have bought, saving that I bade him stay until the licence were obtained. Therefore, seeing these four already now prepared, namely three forth of Almaine, in which behalf by a clause in the treaty of the perpetual peace it should seem that all armour or horses bought in Almaine or Italy for the King's use should be permitted to pass this way without impeachment; I pray you Sir, (quoth I), consider how at least at this time these may pass accordingly." To this M. d'Arras replied, that he admitted the reasonableness of Challoner's request, but hoped that the Queen, regarding the time, their private necessities, and other concurrences, would accept the excuse in good part; that he did not much know Grenado, and did not make him the pretext for detaining the horses, the reason of which was the great scarcity and excessive prices of suitable horses for the troops, who are now commanded upon the review of the musters to re-apparel themselves of horses and other things failed during these long wars. Besides which, though now at peace, it was necessary to provide against the next war, which might come unexpectedly. The King's necessities were also increased by the number of horses which he had lost during the eight years' war, through hard service. M. d'Arras further said that he did not remember the clause in the treaty to which Challoner had referred; to which Challoner replied by taking it out of his pocket and showing it to him. Thereupon M. d'Arras replied that he thought that Challoner had referred to the treaty of 1542, and that he scarcely considered the present treaty to be binding on the successors of the contracting parties. Challenor dissented from this, and, suppressing his anger, left M. d'Arras. Thinks it will be but lost labour to press the matter further with the Regent, as she will be sure to say that she must follow her instructions; he therefore asks Her Majesty to decide on what course it will be best to pursue. He has written to Mr. Gresham with the answer he has had, who wishes him to get forth the licence for the Colen Cleves, as he has shipping ready for them; it shall accordingly be sent to-morrow. Grenado has five horses ready at Bruges. "The scape of them by stealth is difficult, yet possible, as I hear, by means of our merchants, if your Majesty will hazard the adventure of them by piecemeal." He therefore requests the Queen to signify her pleasure to himself, Mr. Gresham, and Grenado.— Brussels, Sept. 29, 1559. Signed. P. S.—Certain Almaines having requested Challoner to offer their services as soldiers, he wishes to know the Queen's pleasure hereon speedily. He encloses pasquils and advices from Rome. Orig. Draft. Hol. Pp. 15. By his letter presently written to the Queen, he may perceive in what sort her requests here are refused, and may conceive hereby what friends such would be at a dead lift who in these trifles open their faintness. Marvels that ever suit should be made to these deaf ears. As touching powder, where may it better cheap be made than in England? Englishmen should be set at work for so much as may serve the realm; also for armour, for surely such necessary instruments of defence ought never precario to be sued for at our fickle neighbour's hands, but be had within our own power. The Venetians of late have invented a sure means to preserve their powder, preparing each kind of the same finely beaten by itself, whereby no casual chance of fire can work upon those kinds not assembled. And yet when they have need, in an hour's space, mixing the "especis" together, they have gunpowder ready. Merchants will furnish saltpetre; as he remembers in King Edward's time certain Italians made large proffers. "If it be known we need not our neighbours' help, it will make them become much the kinder." Some part of the refusal touching the passport for the horses was owing to the small good will here borne towards Grenado himself, for neither of the brethren were here overwelcome to M. d'Arras and others on account of old grudges; and this Bernardine (whom he thinks a very honest and faithful servant to the Queen,) has a free mouth, which has been misliked, so they suspect the horses are for him, and not for the Queen. Touching his letter of the 27th inst. Advises him not to believe the Provensale, its bearer, neither too much nor too little, for the French be fine in their generation. He confessed that he was no Provensale, but a Spaniard, long conversant among the Turks, and once a slave in the Turkish galleys. He was very desirous to know of Challoner what intelligence the Scottish Protestants had with England, for which he referred him to Cecil. The Countess de Feria is brought to bed of a boy, to the great joy of the Count; she had a long travail. The Inquisition in Spain is very terrible; heretics are billed (fn. 5) by bushelfulls. They spare neither small nor great. The people generally grudge at their immodicam potentiam; they may chance to play Samson's part, pull the house upon their heads, as did the Inquisition at Rome.—Brussels, 29 Sept. 1559. Orig. Hol., with armorial seal. Endd. by Cecil. Pp. 4. Endd. by Challoner. Pp. 3. 1395. Ferdinand, Emperor Elect of Germany, to the Queen. Having some months previously written to her that he was about to send an Orator to reside in her Court, he now despatches George Count von Helffenstain, Baron of Gundlfingen, his Lieutenant in the provinces of Upper Austria, for whom he requests credence.—Vienna, 29 Sept. 1559. Signed: Serenitatis vestræ bonus frater et consanguineus. Ferdinandus,—M. Singkhmoser,—V. Seld. B. M. Nero, B. ix. 93. 1396. Another copy of the above. Modern transcript. "Ex originali," with seal affixed. 1397. Another copy of the above. 1398. John Marshe to Cecil. Trusts that he has received his letter sent by Arthur Danbueye a merchant. Has carried J. D. (of whom he has written) to the Ambassador, whose proceedings the writer trusts Cecil will learn by the enclosed letters. J. D. offers to stand to the justification of it upon his life, and doubts not but that Cecil will find true what he has reported. He is loath to come into England, as he is known there; but if Cecil will promise him a safe return, Marsh will travail therein with him. It is written from Venice that Doctor Carne has become Master of St. Thomas Hospital at Rome, and that Wilson, late a prisoner there, is now at Venice. There arrived on the 27th a French Bishop, named of Maug, or Mans, the Prince of Orange, Count Swartzenberg, Count Mansfelt, Count Meaghin, and Count Arnysberg; the Count Horn was here before. What they do he cannot learn.—Antwerp, 29 Sept. 1559. Signed. Orig. Hol. Add. Pp. 2. B.M. Cal. B. vii. 425. Sadler, 1. 467. 1399. Sadler and Croft to Cecil. Alexander Whitlaw, arrived here this morning by sea with letters to him [Cecil] from Arran, and to them from the Duke, the Earl, Balnaves, and Knox, all which they now forward. Whitlaw told the writers that the Regent has sent into France the letters written unto her by the Lords of the Congregation touching the fortifications at Leith. Also that the Lords intend to take and keep Bortycrag; that they had suppressed the abbeys of Paisley, Kilwinning, and Dunfermling, and burned all the images, idols, and popish stuff, and intend to go through with all their matters, without making any appointment with the French, except it be such as shall satisfy them in all points. They have resolved to be together on four days warning, in case it should be necessary to assemble before the 15th of next month, which is the day appointed. They could appoint no shorter day, because their harvest, by reason of foul weather, is not a quarter done. They have 1,000 footmen in wages, for their relief on a sudden, which shall lie at Stirling. The writers now beg [Cecil] to consider how these men, being poor, can go through with such a good enterprise without aid of the Queen, for which, as Balnaves' letter says, they look at the end of next month, without which they cannot keep their men together. Also Knox sues for relief of certain, meaning (though he name them not) the Earl of Glencarn, (a poor man), the Lards of Donn, Ormeston, and Grange, (which is Kirkaldy), and the said Alexander Whitlaw. Think that 4,000l. or 5,000l. would be well spent in their cause, and save the Queen more; for how near it would touch England if the French had the upper hand in Scotland, they refer to her wisdom. Balnaves also writes of the attempts committed by the Graymes against Lord Maxwell, and in writing to Lord Dacres it should be remembered undelayedly, for Whitlaw told them the Protestants think it the Regent's practice to prevent Lord Maxwell from bringing his power from the borders. They marvel that Randall (alias Barnaby) had not reached the Earl of Arran when Whitlaw left. They have given Whitlaw fifty crowns, for he has surely taken much labour. La Brosse and the Bishop of Amiens are arrived at Leith with no great company, and the Bishop, they say, comes to curse and also to dispute with the Protestants, and to reconcile them, if may be. They ask that the next despatch may inform them touching the relief of Kirkaldy, Ormerston, and others, and likewise the safe conduct for the Scots to traffick into England.—Berwick, 29 Sept. 1559. Signed. Orig. Add., with seal. Endd. Pp. 4. 1400. Another copy of the above. 1401. The Knights of the Order of S. Michael. "The placing of the Knights of the Order of St. Michael at Bar-le-Duc, 29 Sept. 1559." The right side; the French King; Dukes of Nevers, Aumale, and Lorraine; Count de Grueres; Prince of Ferrara; Don Francisco d'Este and the Count d'Eu. The left side; arms set forth in the places of the Kings of Spain, Sweden, and Navarre, (the King of Spain's in the midst,) the Dukes of Guise, Namurs, Longueville; the Count Ringrave, M. de Sansac, and the Prince of Mantua. B. M. Sloane, 4134. 517. 1402. Another copy of the above. 1403. Stores in the North. (1.) "The store and remain of all sorts and kinds of ordnance and munitions remaining in sundry places within the north parts, the last of September 1559, wherein is also remembered such supplements of the like kind as are thought meet to be supplied for the defence of every of the said places," viz., of Newcastle, Berwick (town and castle), the castle of Wark, Holy Island, Ferne Island, Alnwick Castle, Norham Castle, and the town of Hull. (2.) "A brief docket as well of the store remaining in the several places before-remembered, as also of the supplements thought meet to be sent thither for the supply and furniture of the same." 1404. Philip, King of Spain, to the Queen. His Orator, the Bishop of Aquila, will inform her how a Spanish merchant, Johannes de Bagnes, was plundered of his ship and stores by an English pirate, "Enrriex Tranguaz" [Henry Strangwish] of which restitution should be made.— Valladolid, 30 Sept. 1559.—Signed: Philippus,—G. Perezius. Orig. Add. Endd. by Cecil. Lat. Broadside. 1405. Throckmorton to the Council. The bearer Mr. Layton, having asked him to be a means for his return home, certifies that he has carried himself in this country so that the Queen may extend her goodness towards him, as he seems to be a faithful subject.—Bar-leDuc, 30 Sept. 1559. Signed. Orig. Add., with armorial seal. Endd. Pp. 2. 1406. Throckmorton to the Queen. Despatched letters to her on the 24th inst., by M. de Carowge, supposing he would have passed immediately by post. Notwithstanding he is arrived here at Bar-le-Duc and is not yet despatched. Whereupon reports to her the effect of his letter of the 23rd inst., in case Carowge remain here longer than the writer expects. The rumour of the surprise on the town and castle of Guise rose upon the Duke going to Guise, and certain pillage made by the garrison of St. Quentin's, and is altogether contrary. The Prince of Orange is licensed to depart into Flanders, and is already departed. The 24th the King removed from Rheims to Notre Dame d'Espine, two leagues from Chalons; on the 25th to Vitry-le-François, in Pertois; and the 26th he arrived at Bar-le-Duc, where the Duke of Lorraine has made great feasting and kept open house ever since. The old Duchess of Arscot met the King there. It is agreed here that the Duke d'Aumale shall be sent into Scotland; he does not know whether his brother, the Marquis, shall also remain there or not. On the 28th inst. John Ribaud arrived here in post, for order to convey more foot into Scotland, which he has reported to a friend of his [Ribaud's] of some credit. Lately have arrived from England divers mulets and horses; which come either from the Ambassador there or some of the hostages. This happening at a time when all their doings are against Scotland, he advises her to look well to their hostages and remove them far off from London to remain in places apart, whereby their consultations together may be taken away, wherein they have a great advantage more than she has, they having a Council there, and the Queen but one on this side and without experience, remaining for the most part in the heart of the country, far from intelligence. It is reported that Carowge on his return from thence shall be appointed Ambassador with her; or that he shall remain there as hostage instead of the Marquis of Neile. He is as good a man of war as any in France, and of great practice. In reply to the Duke of Chastelherault's gentleman, touching such requests as Throckmorton signified to her before, the King says, that on his coming to Blois he will give a resolute answer in the same. This will not be for six weeks at the soonest. The nine tenths, which before the taking of Calais were granted by the clergy to the late King, still continue, and amount to a great mass of treasure. On the 28th inst., one of good estimation arrived at this Court with letters from the Count Palatine to the King, the Queen his mother, and to the Duke of Guise; on which day also arrived, out of Scotland, one John Leveston, who came through England, where he was stayed four days before he could be despatched. He brings news that the Congregation was about to assemble at Stirling, where they were met in some companies already; that the Earl of Morton was gone to the Queen Dowager; that the Earl of Arran was arrived in Scotland through England, where he said he was well received; and also that at his coming from Scotland he left the Earl of Arran with his father, at Hamilton Castle; which Earl was very welcome in his country. On the 27th inst. the writer received a letter from Sir Francis Englefeld, dated at Paris on the 19th; whereby he signified that he was arrived out of the Low Country in his way towards Italy, and that he supposed to have found Throckmorton at Paris, where he would attend eight days. The writer returned him answer that he was at Bar-le-Duc, too far off to speak with him, seeing the time of his tarrying there had already passed; notwithstanding if he could stay then till the 13th of next month, he would then speak with him on arriving in Paris. The Cardinal of Guise arrived at Rome on the 15th inst., whence news have come that Cardinal Carpi is like to be elected Pope. The Baron de la Gard is here at the Court still; he will shortly receive his commission for the preparation of galleys against the next spring. The French Queen, (who, since her being at Villiers-Coste-Rez, contrary to her wont, has found herself well,) on hearing the news of Leveston brought from Scotland, has fallen sick again, in such sort as on the 28th inst., she being at evensong to see the ceremony of the Order, was for faintness constrained to be led to her chamber, where she swooned twice or thrice. There is presently no Ambassador at the Court but himself, the rest are at Rheims; he, considering the importance of her service, thought it not good to leave the Court. Was not invited on the 28th at evensong to the ceremony of the feast of the King's Order; but the next day in the morning was appointed to be there; and was present all the service. Incloses her a schedule of the Order and places of the Knights present. Neither King's mother nor the French Queen were present at these ceremonies. After service was conducted to dinner, accompanied with the Bishop of Rucz, Montpesat, and Carrowge. This ended, he was brought into a hall, where the King with the Knights of the Order were newly risen from dinner. Was courteously entertained at the King's hands, who inquired after the Queen. The Duke of Guise told him that the King had spoken for the restitution of his virginal player. When the Duke had ended, Don Francisco d'Este declared to Throckmorton the good affection he bore towards the house of England, and his readiness to do her service. He arrived at this Court out of Italy in post the 27th inst. M. de Sansac, Knight of the Order, goes from the King to the Emperor to make some alliance and to conduce to a good end the controversies for the imperial towns in the Frenchmen's hands. The Marshall Brisac shall be revoked from his charge in Piedmont, whose suit for his brother Gonorre to be placed therein is refused. Don Francisco d'Este, who has a band of 50 men of arms given him, desires to succeed Brisac, but the Duke of Guise likes not the offer; is thought that by the Duke's appointment the Marshal Termes shall be sent thither. On the 29th inst. there arrived letters from the Genoese declaring that Corsica was rendered to them. Whereupon one M. de Magny is appointed to repair to St. Quentin's, which, with the rest of the pieces there, shall be rendered to the French. On the same day, Sigismundo Gonsaga, kinsman of the Prince of Mantua, delivered letters to the King in favour of his entertainment here, who arrived two days before. The French intend to fortify Calais; and order is given for the same.—Bar-le-Duc, 30 Sept. 1559. Signed. Orig. Add. Portions in cipher, deciphered by Cecil, and endd. by him. Pp. 8. 1407. Another copy of the above. Wrote to him from Rheims by M. de Carrowge on the 23rd inst., the effect whereof he hereby repeats, the said Carrowge not having departed, which was that he wrote to the Queen some matter of importance concerning England, agreeing with other advertisement sent him of the French practices against her and the realm. Beseeches him, as a great part of the government depends on his shoulders, to act so that the worst being prevented the best may save itself, and not to judge of his advertisements as Wotton's were for Calais, for it may be too late when the enemy are at the door to put anything into execution which may be with less care and charge provided. Though he knows that Cecil's carefulness is great, yet being troubled with the common bruit of the French Queen's pretence to the realm of England, her open usurping of the arms and other things, he cannot hold his peace. Let them not tempt God too far as Queen Mary did, referring all things to Him and doing nothing, the success whereof they yet smart. For the rest he refers him to the Queen's letter. Since then he has received Cecil's letter of the 5th inst., and others from his wife, whereby he understands that the order for transferring his diet from three months to three months was not observed; and albeit the officers of the Exchequer have the warrant in their hands, yet the last three months are not answered. Reminds him that he was by the said warrant appointed to receive in prest from time to time the said three months beforehand. His ability to forbear the same is small, and his charge greater than he can bear, especially in travelling. Has also reminded the Treasurer of the same. An honest poor man, named Sir Edward Atwood, being asked by the Cardinal of Sans to go to Rome has refused to do so, and left the Cardinal's service. Throckmorton has moved him to repair to Cecil, whom he asks to receive him. Refers him to his letter to the Queen.—Bar-le-Duc, last of Sept. 1559. Signed. P.S.—Hears that forthwith either Protestant or some other courier will be despatched into Scotland with advice from hence for their proceeding. It is thought that Carrowge shall carry the packet into England, where the courier shall receive it and carry it to Scotland. Orig. Add. Portions in cipher, here deciphered. Endd. by Cecil. Pp. 3. Touching the changing of the Wardens of the East, West, and Middle Marches, thinks it necessary that they should be changed, for more unmeet than these be, he [Cecil] cannot lightly put in their places. Sadler never saw the Marches better ordered than in the time of the late King Henry, when the three Wardens were, Sir W. Evre for the East, Sir R. Evre for the Middle, and Sir T. Wharton, now Lord Wharton, for the West. Thinks that Sir James Crofts is the most meet man for the charge of the town (Berwick) and of the East March; this town being the best for the Warden to lie in, as then he can have both under his rule, and may always draw off the power of the county into the town for its defence, and likewise relieve the country with the garrisons of Berwick. But fears that Croft cannot dispose himself for this office, being poor, and that he cannot have his health in that country. Yet he could not find a meter man that he in all England. For the Middle March knows none in Northumberland so meet as Sir J. Foster, who might lie at Harbottel, if it were repaired a little; being a meet place for the government of the unruly countries of Tynedale and Riddesdale, the charge whereof should be committed to him who has the charge of the Middle March. For the West, the Lord Wharton, and next him Sir Thomas Dacre, having had experience of this a long time. If these be not liked, thinks then that my Lord Grey, having the head officers of Berwick, as the Treasurer and Marshall, to be as counsellors with him, were, in his [Sadler's] opinion, well able to take charge of that town, and also of the wardenships of the East and Middle Marches, having always a deputy warden at Harbottel, (for which the said Sir J. Foster is meet) the said deputy warden to have the whole entertainment accustomed for the charge. And he would wish that, in lieu thereof, the Lord Grey should have also the office of Norham, having the entertainment accustomed for that town, and also for the wardenry of the East Marches with the said office of Norham. For the present Cecil would do well to commit the wardenship of the East March, with the charge of Berwick, to the said Sir J. Croft, and the wardenry of the Middle March to Sir J. Foster. He [Sadler] is not so well acquained with the West, but thinks that Lord Wharton might have rule there, or else Sir Thomas Dacre. Has lately received a letter from the Lords, about Warke Castle, to remove fifty soldiers of Captain Read's band from thence to Berwick, and to deliver the house to Sir Ralph Grey, which they have done; but thinks that if it is no better guarded than by his covenants he is ordered to keep it, it were an easy thing to surprise it suddenly, therefore they have sent thither twenty-two harquebusiers, and four gunners. Thinks Warke surely the meetest place for a man of service to lie in, and wishes that the Queen would be at some charge for fortifying it, so as to make a strong frontier. Thanks the Lord Admiral and Cecil for visiting his poor house on their way to the Court, and wishes it had been his chance to have seen them there.—Berwick, 30 Sept. 1559. Orig. The first portion is written entirely in cipher. Add. Endd. Pp.5. 1410. Another copy of the above. 1411. Decipher of the first portion of the last letter. 1412. Sadler and Croft to Cecil. Have received his several letters of the 22nd and 23rd, which were six days acoming, and beg him, as they do, to endorse his letters "for life," or else the posts will not haste at all. Have declared to Alexander Whitlaw that he may advertise the Master of Maxwell that it is not the Queen's pleasure such cruelty be used towards him by the Graymes, and also to advise him that if he be further molested, he complain to them [Sadler and Croft] that they may devise some way for his redress. They think it unnecessary to offer to favour him secretly in Ireland, for if it please him [Cecil] to take order that he be no more interrupted by the incursions of the Graymes, he will be able at his pleasure to repair to the Protestants with his power. They think it well that the Lord Dacres be called to Court, and that no attempts be made by the Graymes or other Englishmen during his absence. At his coming up he may well be charged with negligence, having in time of war sat still, and now in time of peace sought to increase unquietness, which he might have stayed, had he listed. His sickness alone is worthy to unfit him for the charge.—Berwick, 30 Sept., 1559. Signed. Orig. Add. Considerable portions in cipher, deciphered by Cecil, and endd. by him. Endd. Pp. 3. 1413. Another copy of the above. B. M. Sloane, 4734. 192. Calderw. 1. 521. Knox, 1. 419. Memorial of John Spense, of Condy, sent to Lord James. 1. He is to say that the Regent's great favour towards the Lord James moves her to send the bearer. 2. That she knows that the occasion of the departing of the Lord James from her was the favour of the Word and religion, with which, although she was offended, yet will she bear with him in that behalf as far as may stand with God's Word, the common policy of this realm, and the Prince's honour. 3. That the occasion of assembling her men of war and fortifying Leith was that she understood that it was not the advancement of religion that was sought, but rather a pretence to overthrow the authority of the Queen, of which she believes he is not participant, and trusts more in him than any other man. 4. She offers to send away the men of war if the former suspicions could be removed, and laments the trouble that appears to follow if the matter is left long in debate. She promises her faithful labours for reconciliation. B. M. Sloane, 4737. 107. 1415. Another copy of the above. MS. Burton-Constable. Sadler, 1. 474. 1416. Randall to Sadler and Croft. Doubts not they wonder where he is become. His way was so evil prepared for him at Fernihurst that he was fain to tarry there five days. At his arrival here he found the Earl of Arran was at S. Andrew's with the Protestants. He will await the Earl's return on Sunday next. The Duke wishes him to remain until the 15th prox., when the Lords of the Congregation assemble. The Regent has written, reproving the Duke for joining the Lords of the Congregation, and the bearer had also credit to talk of agreement, of which the conditions were, to leave the fortifying, liberty of conscience to all, and the French to depart by a day. He answered he could nothing without the Lords of the Congregation. On the 28th he received a letter from La Brosse and the Bishop of Amiens requiring him, in the King and Queen of Scotland's names, to appear at Edinburgh on the 6th October, but he refused. The Archbishop of S. Andrew's and the Abbot of Kylwynyng have left the Regent, but are very angry with the Duke. The Papists mistrust themselves; they are not above 3,000. The Lord Erskin has promised to keep the Castle of Edinburgh. Would be glad to hear news of the King of Sweden.—Hamilton, 30 Sept. 1559. 2. Dated 27 in the draft, (see No. 1393. ), and referred to as such by Challoner himself in his letter of the 29th; probably the draft was written on the 27th, and the fair copy for despatch was made on the 28th. 3. The contemporary transcript and decipher here reads, "Mr. Marshe." 4. This P.S. is cancelled by Challoner. A memorandum on the first page makes it probable that the postscript referred to "the stir in Spain." 5. So also in the duplicate copy.